Leather was hot on the catwalks this season, making it a worthy wardrobe investment. This year it comes in the form of a sleek pencil skirt, keeping it feminine and fitted for both casual and smart occasions. Online women’s retailer, Pure Collection, style their leather skirt with some fabulous jewel brights and textured accessories for a truly on trend autumn outfit. Simple and stylish, this Leather Pencil Skirt, £199 is made from super soft nappa leather in a sumptuous, rich chocolate shade. The zip at the back is concealed for a smooth fit and it’s fully lined with a centre vent at the hem. The rich leather is contrasted with an eye catching mustard Cashmere Cropped Round Neck Cardigan, £99. It comes in 100% pure sustainable cashmere, accented with neat rib trims and dainty mother of pearl buttons. Hand finished, this cardigan has three quarter sleeves and comes in sizes 8 to 18. Autumn brings with it unwelcome cold winds, but the stylish solution is to keep your hair neat under a Classic Beret, £49. Made from 100% cashmere and in lush blackberry, this hat will set off any outfit with an air of Parisian chic. With a soft leather exterior and luxurious cashmere lining, these Leather Gloves, £69 are the perfect way to keep warm and incorporate the leather trend into your outfit. This tan coloured pair sit beautifully between the dark skirt and bright cardigan. 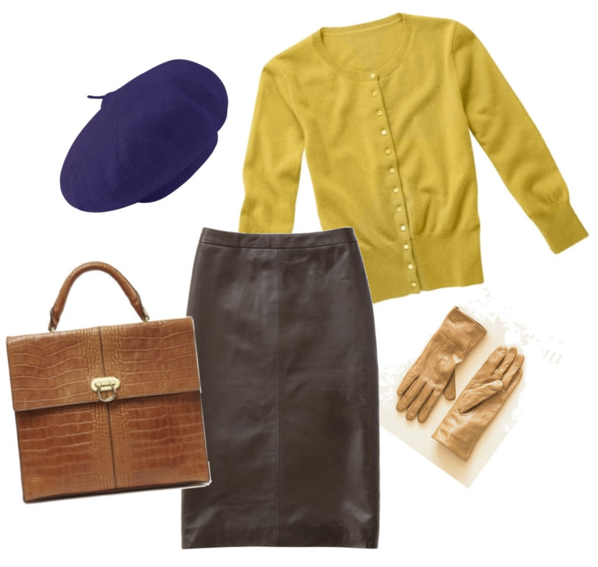 To complete this autumn outfit, add in a new and complementary texture in the form of the Mock Croc Handbag, £199. It’s a sophisticated and structured addition to the leather skirt and features an embossed mock croc finish and gold clasp.